Recently, Shih Tzu Dad and I noticed Lucky wasn't moving around well. He walked slower than normal and started running into things. Lucky has had previous problems with his eyes so we booked an appointment with the ophthalmologist. We were hoping it was something that could possibly be treated, like cataracts. 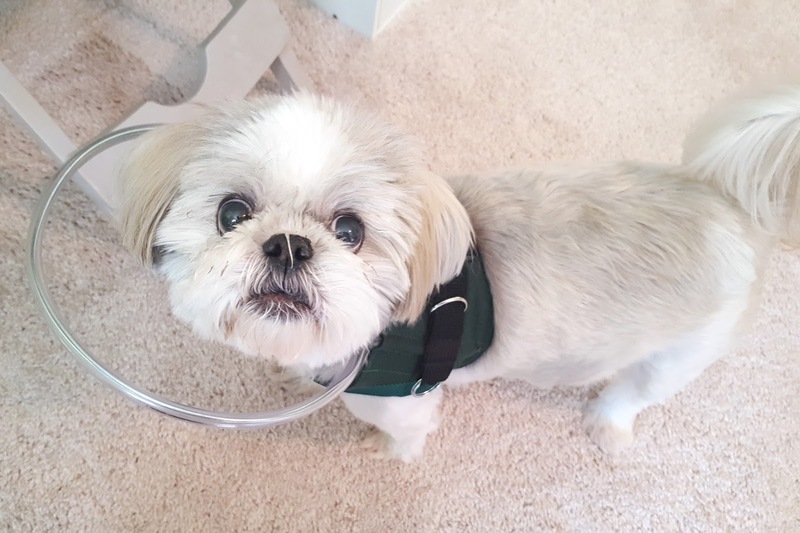 However, the doctor told us Lucky has something called SARDS (Sudden Acquired Retinal Degeneration Syndrome) which simply put is sudden blindness. They told us he was completely blind in one eye and the other could only see light and shadows. There is no known cause or treatment for SARDS so all we could do was take Lucky home. 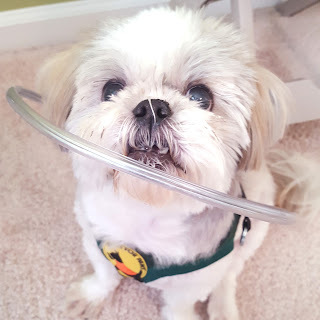 While discussing what we could do to make the situation easier for our little boy, I remembered seeing something about a vest with a hoop that blind dogs could wear so they didn't run into things. 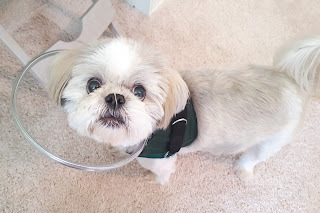 Shih Tzu Dad did some research and found Halos for Paws. 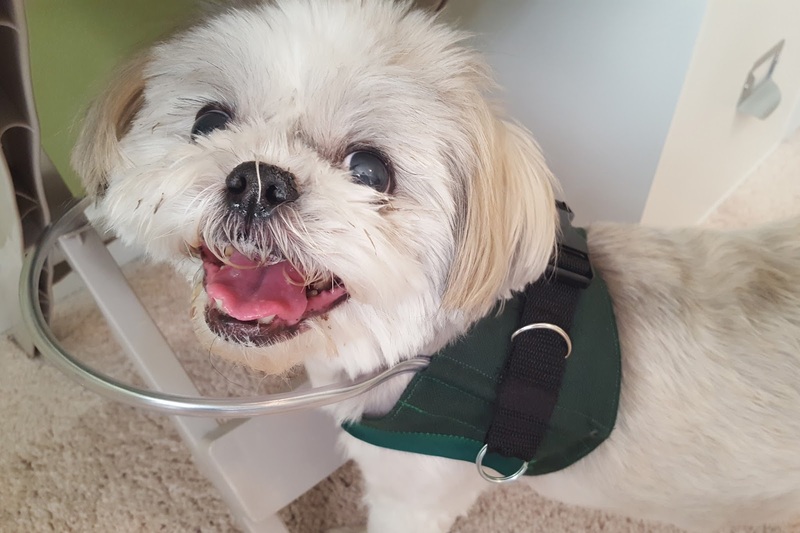 We sent in Lucky's measurements and waited for his new harness to come in. It took Lucky a day or two to get used to having something around his head. He walked around slowly and when the ring hit something, he would be startled for a moment. We had him wear it in small doses, mainly in rooms in the house he wasn't in all the time. He navigated in his normal spaces quite well without it. 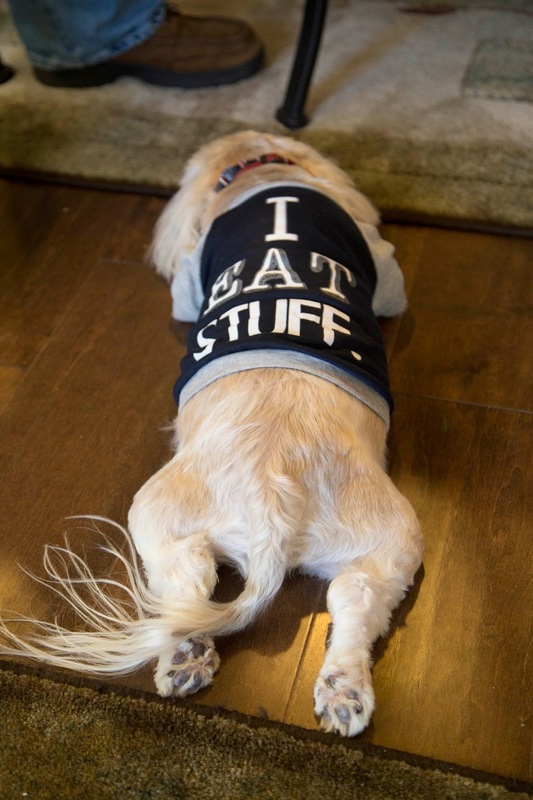 Once he got comfortable wearing it, he walked around at his normal pace and was no longer surprised when the ring hit a wall or piece of furniture. Now, in true Shih Tzu fashion, he has found a way to not only use it for it's original purpose but to benefit him in other areas as well. He now treats the halo as his own personal battering ram and pushes things around with it! Every so often we have to slightly bend back the ring to a circle shape as he has pushed on it a little too much. We are happy that the halo can give Lucky back some of his confidence and make his new life as a blind dog more manageable. First ride in the car, on her way to our home! 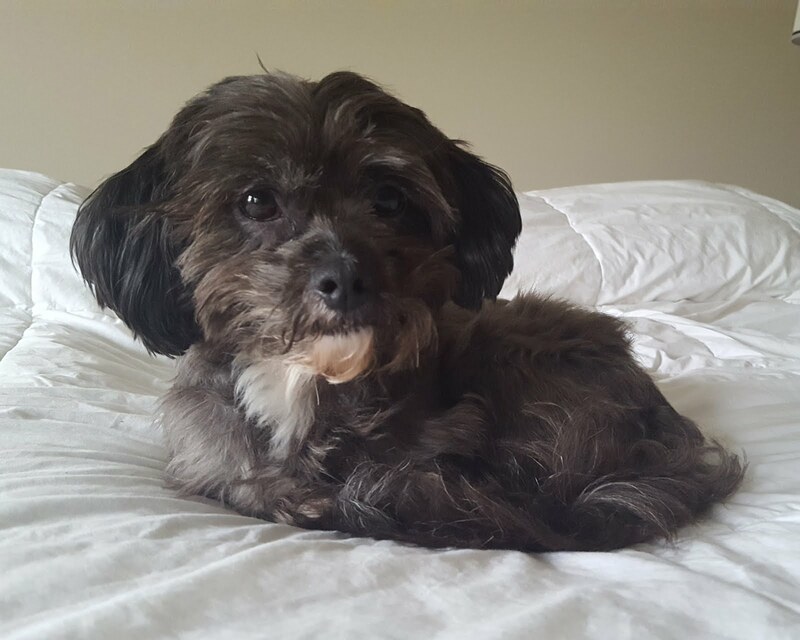 Kiwi came to us through Paws and Stars Animal Rescue. She is part Shih Tzu, part Havanese. 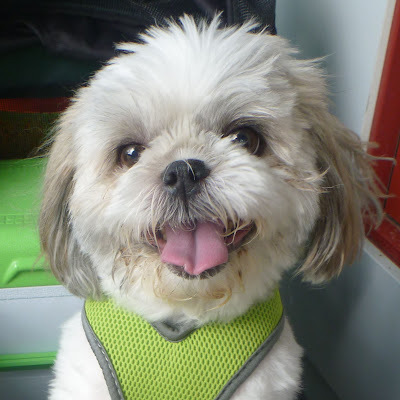 Shih Tzu Dad had been following the rescue organization's page on Facebook and shared Kiwi's story with me. 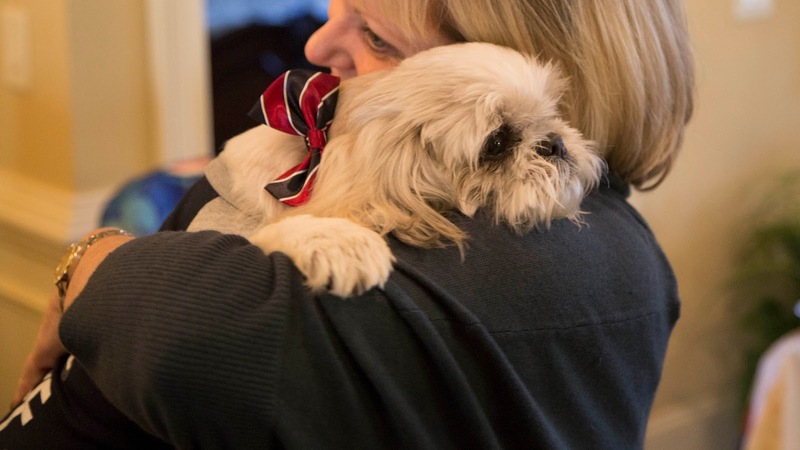 She was named Dolly and her owner surrendered her to the rescue because she had massive kidney stones and they couldn't afford the surgery to help her. It was so sad! If you recall, Lucky had a similar story where he was having trouble getting adopted because of a medical condition. So of course, little Dolly got my attention! The rescue took great care of her and rushed her to surgery. Here is a picture of her stones. Her bladder is very small so you can imagine having three rocks the size of walnuts sitting in there must have been so painful! 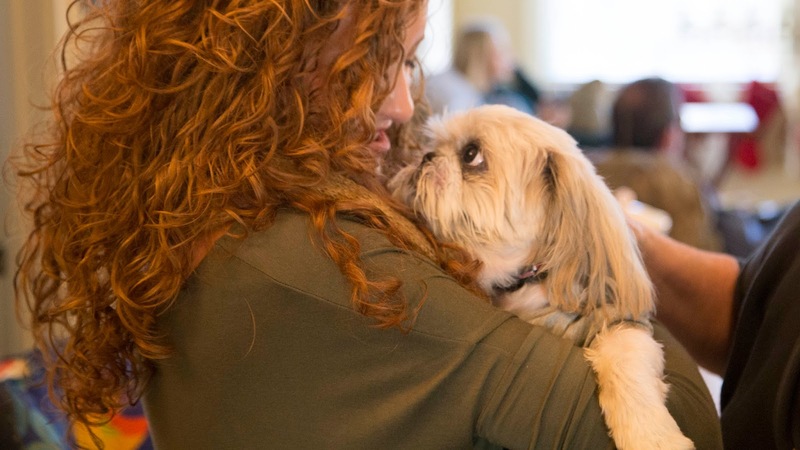 She went through surgery so well and once she was recovered, her personality started to shine. She was very loyal, calm and happy. I put in an application for her right away. After the rescue checked us out and called our references, they let us schedule a time to meet her so she could interact with us and Lucky. We didn't want to rush into it so we made sure she was allowed to check us out and see how her personality meshed with Lucky's. 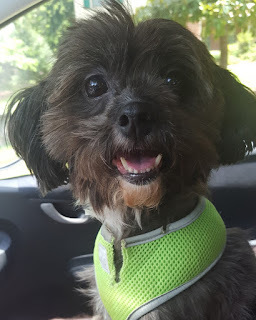 Even though she was adorable and I have the urge to save every fur baby I can, we wanted to make sure our home would be the best place for her. We fell in love with her. I decided to rename her Kiwi (because she is small, brown and fuzzy!). The first night she was home with us, we put a bed under the end table in the living room for her to sit. The rescue told us she liked to stay under things (like a table or chair) at first until she was comfortable enough to come out. We thought she would stay there that first night but after just a little bit she ventured out and sat with us on the couch! When it was time for bed, we brought her bed up to our room. Lucky sleeps in the bed with us but we didn't want to pressure Kiwi on her first night. We put her bed next to ours in a large, soft, mesh crate and just left the door open. She walked right in and laid down and got comfortable. We thought she would stay in there for a few nights until she was ready to come out and join us. After she had gotten settled, we started getting into bed. She immediately poked her little head out of the crate and watched us. Then she walked right over to the bed and hopped up! She snuggled next to my legs and made herself comfortable. That is when I knew we had made the right decision to bring her into our lives! Yes, this bed is comfy and will do nicely. We look forward to new and continued adventures with our new family of four! 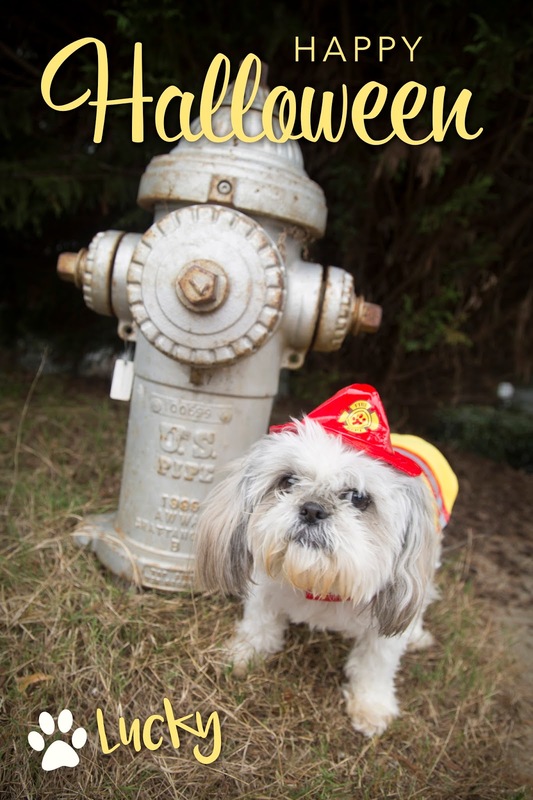 The Shih Tzu Family didn't travel for Thanksgiving this year. 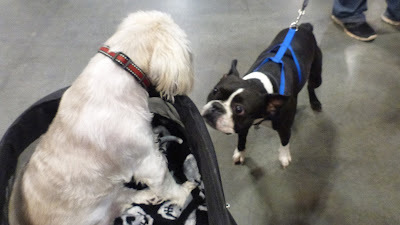 Normally, we would have been in Florida visiting Shih Tzu Lola and Papa but they were traveling to see Shih Tzu Mom's sister. 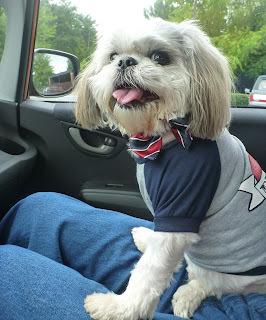 So this year, we went over to Shih Tzu Nana and Paw Paw's house! I put on one of my cutest outfits. 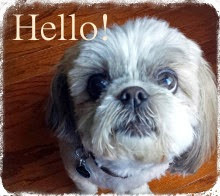 The cuter you are, the more likely someone will "accidentally" drop a piece of turkey near you. I scouted out the food situation as soon as I got there. There was lots to choose from! If there was a chunk of the ham missing later, I had nothing to do with it. 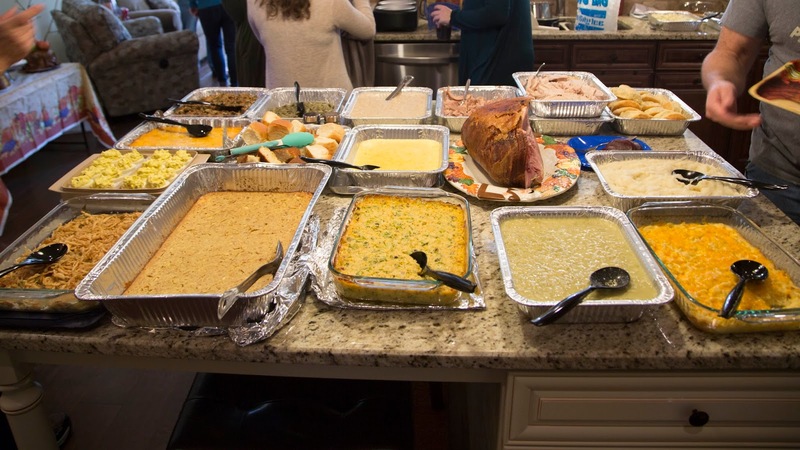 I have no idea what the turkey taste like either. That is what I am telling Mom anyway. Shhh. I got lots of cuddles from Shih Tzu Dad's family while we were there. They just couldn't put me down! After snuggles with the ladies, I had to get my guy time in and watch the game. I don't know how they pay attention to anything with those phones out all the time! 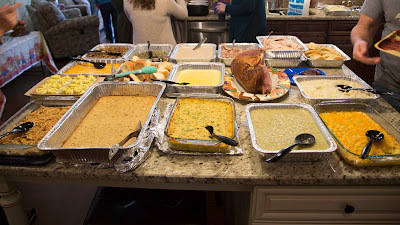 Even though I "didn't eat the turkey", for some reason I was pooped! I hope you all had a fun-filled holiday as well! Let's Go to the Expo! 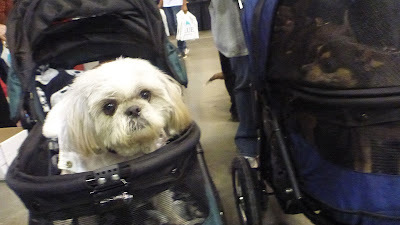 Shih Tzu Mom and I recently ventured into the city to go to the Atlanta Pet Expo. I'm always up for a ride in my stroller so we met my chihuahua friends (who just got a new stroller of their own) and went exploring. 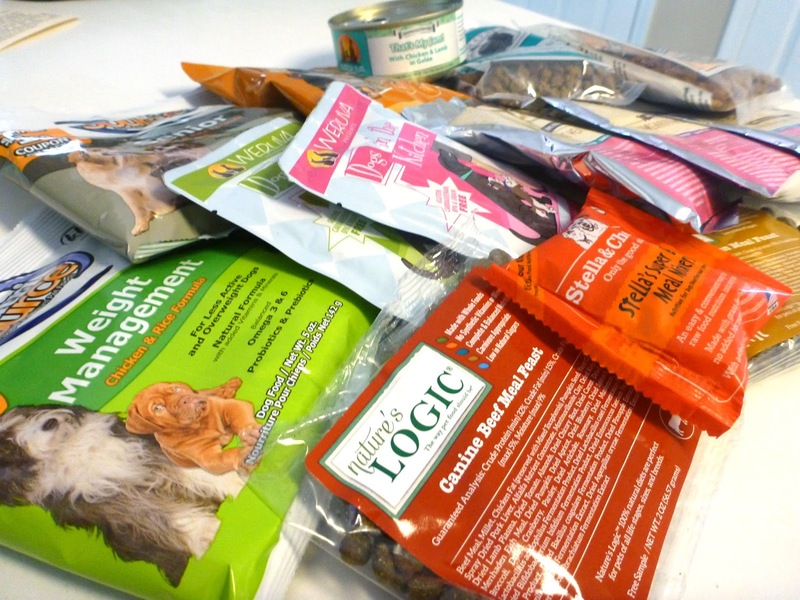 As well as human ones! The very nice State Farm lady gave me a bacon treat. She broke it up into little pieces and hand fed me every last one. 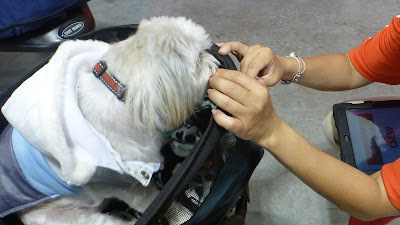 Of course, we couldn't get out of a pet event without Shih Tzu Mom buying me something to wear. I ended up with this hat. Everyone at the booth thought I was just too darn cute not to have it! 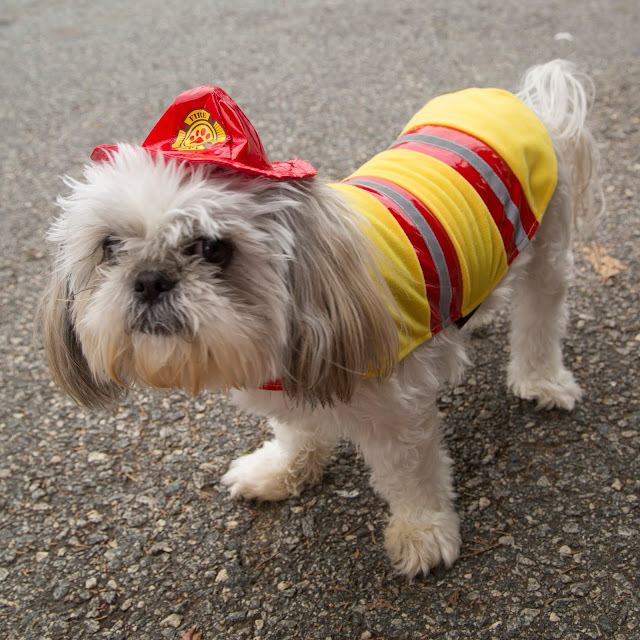 We had such a great response last year when we asked our friends on Facebook to help us decide which costume Lucky should wear for Halloween that we did it again this year! 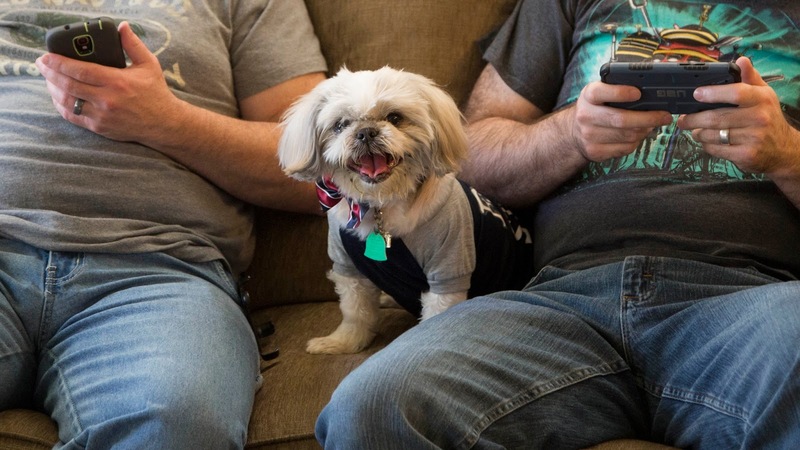 With all the adorable options out there, Shih Tzu Dad and I had a hard time narrowing it down to four choices (one for each #TooCuteTuesday in October). Thanks to everyone for liking the pictures and joining us in deciding which one Lucky should model this year. It was such a close race that we included our Twitter followers in the vote this time. So which one is the winner? Fireman! 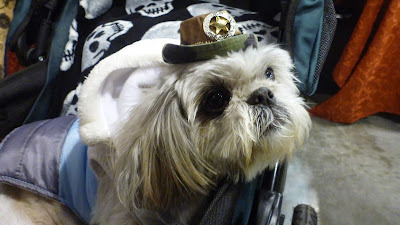 I think this was Lucky's favorite costume too (if he just HAD to pick) because it has the least annoying hat. As usual, Lucky was a great sport for letting us parade him around in multiple costumes and we hope you enjoyed seeing them and all the other #TooCuteTuesday pups on our Facebook page. Hope all our friends have a fun and safe Halloween! 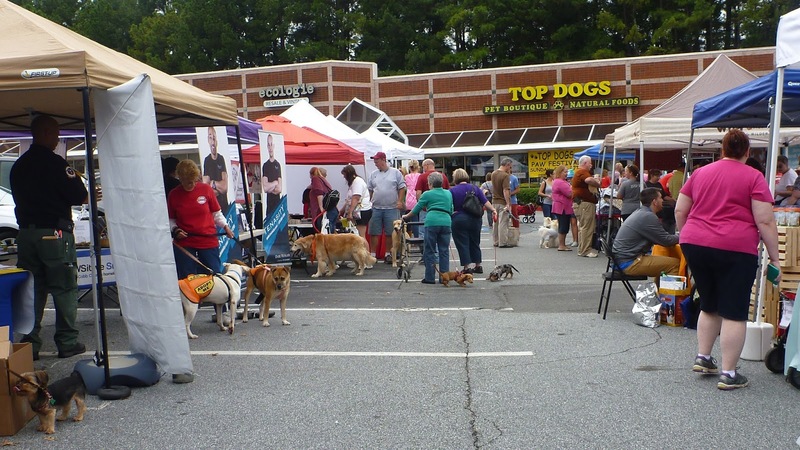 This past weekend we dropped by Paw Festival 2015 hosted by Top Dogs Pet Boutique. The boutique always has the cutest things for all the fur babies in our lives and we were excited to meet up with some friends and explore the booths. Plus, proceeds from the event benefited local pet rescues and we always like helping them out when we can. We arrived and noted the schedule of activities: fashion show, kissing contest, raffle and more! 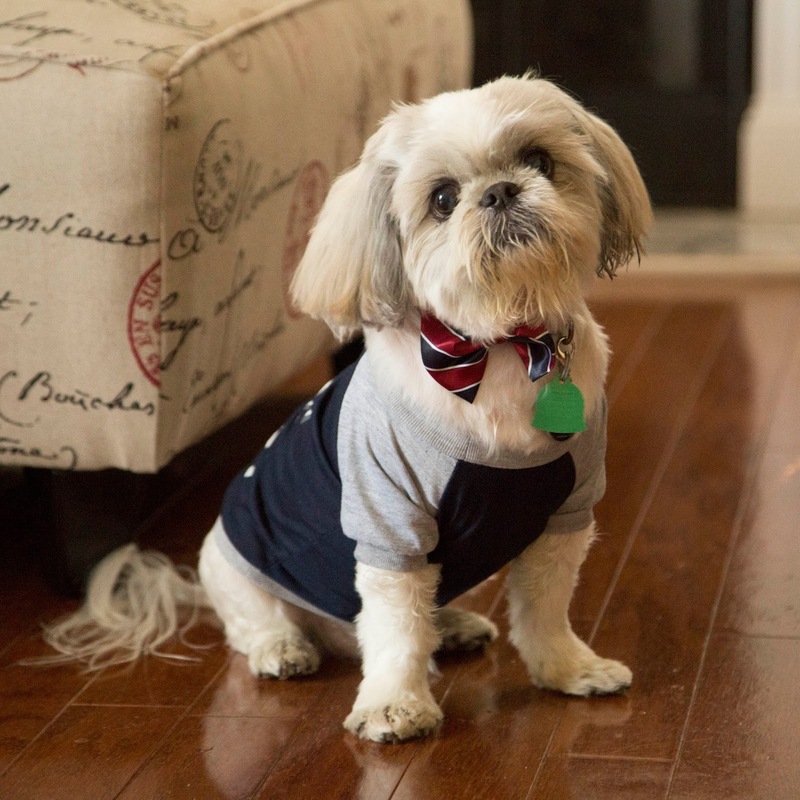 We asked Lucky if he would like to be in the fashion show competition but he declined. He knew he would win with just his first dashing look at the audience and wanted to let the other pups have their moment in the spotlight. How gracious! 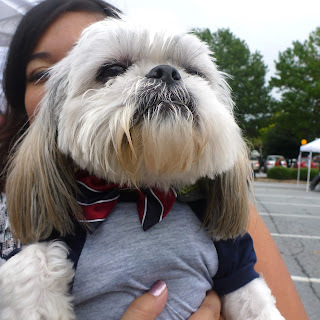 We made our way around the booths as Lucky was particularly interested in checking out the food vendors. There were many a natural treat to try here, some chicken yumminess there. Lucky insisted we not miss a single one. Even though he would not be showing his stuff during the fashion show, Lucky made sure to give his best regal look to whoever stopped to admire him. Hello Friends! Hope you are having a wonderful weekend. I wanted to take this opportunity to let you all know how Lucky's meningitis is progressing. He's been having monthly check-ups to make sure the meds are doing what they are supposed to. He only has to take the steroids now and his dosage has been lessened with each check-up. The doc says he is doing great and we should be able to get him down to the smallest dose of steroids taken every other day. He will likely need to be on them the rest of his life to hopefully keep the meningitis at bay for good. If he were to miss any dose, it could come back. And the doc says if it does, it will be with a vengeance! So Shih Tzu Dad and I make sure he gets that pill on time, every time! We recently ran into a conflict of the meningitis when we took Lucky to his annual wellness appointment. Lucky has possibly the rarest form of meningitis which is auto-immune. He didn't get it from an outside source, like a tick. His body just turned on him. Since there is little to reference for this form of meningitis in dogs, the vet recommended he get as few vaccinations as possible. They just don't know how his immune system would react. So Lucky got the three-year vaccine for rabies and that was it. We monitored him closely afterward to make sure there wasn't any reactions and he seemed fine. So all-in-all, Lucky is doing fabulous! If you were to meet him, you'd never know anything was wrong. He's such a mellow, happy puppy and we plan on having him around for many years to come.